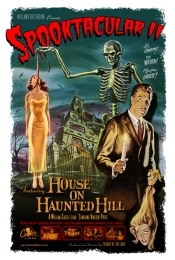 Los Angeles, California-based Holland Releasing has announced that its next theatrical release, SPOOKTACULAR II Featuring William Castle's Original HOUSE ON HAUNTED HILL, will be the firm's first all-digital release. "With theaters slowly beginning to change from traditional 35mm to digital projection, SPOOKTACULAR II moves us in an exciting expansion of the typical distribution business model," says Thomas W. Holland, the company's president. "We'll always have our roots in 35mm film, but we plan to also offer theaters digital formats of all our upcoming films, " Holland continued, "And in the case of SPOOKTACULAR II, we're going all-digital -- anticipating a diminishing need for film prints over the next couple of years." SPOOKTACULAR II, a two-hour program that includes the classic Vincent Price horror film as well as vintage trailers, a short subject and a cartoon, will be offered to theaters in both DCP and Blu-Ray projection formats.